While standing in line at the box office Thursday, we were told that Mahler’s “Resurrection” Symphony would begin a bit later than the usual BSO start time of 8:05, and that there would be no intermission. The out-sized orchestra tuned, the huge Tanglewood Chorus seated onstage, the crowd at Symphony Hall hushed, there was everywhere in evidence a feeling that something quite special was going to take place. After having worked his way through the orchestra to the podium, Christoph von Dohnányi took little time in acknowledging a warm Boston welcome, instead prompting us with a simple gesture that far more important matters were at hand. And just as we were informed earlier, at exactly nine minutes past eight o’clock (is there something to this number? ), Dohnányi set into motion Gustav Mahler’s epic Symphony No. 2 in C Minor. As fortissimo strings with bows tremulated on the dominant of that key, the G above, the tone of expectancy seized our rapt attention, which would persist undiminished over the ensuing hour and a half to the symphony’s concluding monumental cadence. The composer himself describes each of the five movements: In the first, we stand by a coffin questioning life and death. In the second, we remember happy moments of the past. During the third, we are caught up in the bustle of life. Next, we hear a voice of faith in the song, Urlicht (Primal Light). In the fifth and final movement, we are face to face with that dreaded day and, rather than being judged, we find ourselves with a supreme love shining upon us. With such a sea of instruments and voices before him, Dohnányi masterminded a performance reaching heights rarely experienced at Boston’s symphonic shrine. Without a single show of flashiness, the seasoned conductor led, from memory no less, the teeming myriads of notes of Mahler’s still popular symphony to inevitable yet fresh destinations. Mahler was never so elegant, so wrought with musical design, and so deeply moving. In the opening movement, to be played “with complete gravity and solemnity of expression,” woodwind doublings and an English horn solo were as impeccable as they were affecting. The first of a number of wow! moments came in the first gigantic climax with a full orchestra display of power. Expressing suffering and sorrowfulness in perfect balance with reserve captured completely the most singular characteristic of the composer’s personality. Yet another moment! Now 23 minutes into the work, the first movement over, Dohnányi sat down on a stool, and with the hundreds of musicians onstage, waited in silence for five full minutes while latecomers took to their seats. There was much to see as well as hear beyond the classic discipline of the conductor, the Tanglewood Choir remaining seated—and still—throughout most of the long symphony. The BSO strings looked ever so inviting as the violin and viola, each split into multiple sections, held their instruments like guitars, plucking away in the “very easygoing” second movement. The pizzicato harmony coming toward the end caught at least one string player off the beat, but the final plucked chord was right in time. The clarinet’s coloring of the third movement with refined echoes of the klezmer sound was also inviting. Captivating orchestral solos, doublings—and even triplings—so challenging when that many different instruments must play in unison—families, and tuttis would run the whole nightlong. Despite the commitment of soprano Camilla Tilling and mezzo-soprano Sarah Connolly, their vocal production was un-idomatic in Mahler’s non-operatic work. 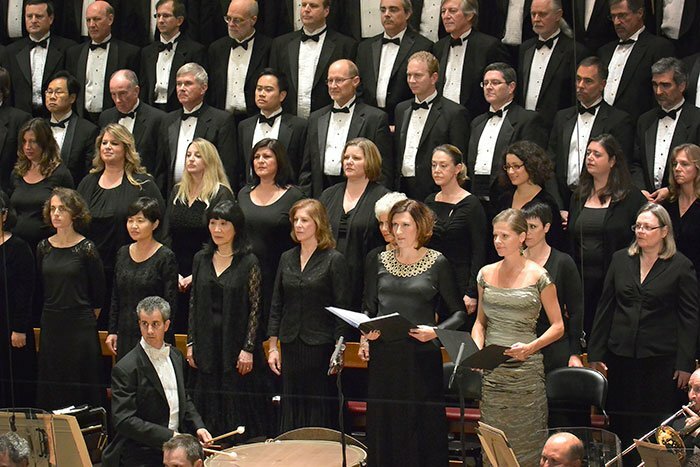 John Oliver’s splendid Tanglewood Festival Chorus, with the onstage and offstage instrumentalists of the BSO, created miracles of music and meaning. Emotions ran high in Symphony Hall, and this time I was one of those who leapt to his feet with hands noisily coming together in round after round of resounding applause. Dohnanyi may well have conducted from memory on Thursday, however he used a score at the performance I attended on Friday – if this detail is important. I have read about Mahler’s instruction for a five-minute pause, but have never been to a performance in which it was observed. I look forward tonight to my first experience of Historically Informed Waiting. It’s in the score like every other signpost from the composer. Little historically-informed about that. More correctly, performances that don’t observe the pause are musically uninformed. Thank you both for reminding me of Mahler’s instruction, in my mind was what an usher told me. I may have been mistaken about his memorization. I had my own nose in the score. Yes, the conductor did use a score on Friday afternoon. I could see it clearly from my seat in a side balcony. Mahler put in the pause because he knew there was an imbalance between the first and second movements (he said this happened because he designed the two movements independently without any thought of connecting them). He didn’t like the solution but could not provide a better one. Though it is in the score, it is more a conductor’s stratagem than a precise notation. I went last night. Stunning. a magnificent display of orchestral virtuosity. When I first read it I thought the review was a bit effusive, but now I understand. I liked the choice to place the soloists back with the chorus instead of front and center (is that in the score as well ?) When the Urlicht began the singer’s voice seemed to rise from the center of things. The pause was interesting. It was similar to Cage’s 4’33”, only longer. Perhaps Cage was inspired by it. There’s a musicology thesis in that, mark my words. Actually it seemed shorter than five minutes. However long it was, I think it was shorter than the period of applause at the end, which was only right. Listening to part of the broadcast last night I believe that the “pause” was shorter than a full five minutes; I would have planned to catch the rebroadcast next week but now I’ve learned that WCRB has cancelled those rebroadcasts – along with almost all of WCRB’s other original live music programming and production – all that seems to be left are months-old recordngs streamed on the website. Drive Time “Live” hasn’t had a new episode since May…. I also fear that this year was the last in which we’ll see the entire Tanglewood season broadcast. WCRB has been reduced to a CD jukebox and now operates with lttle creative programming to make it interesting. Sad and infuriating! In his M2 performances Ben Zander observes the pause. Elom is entirely too correct about WCRB (“a CD jukebox”). And today there was no SymphonyCast, the station isn’t even listed any longer in American Public Media. During the last winter season, WCRB was playing repeats of each week’s Saturday-night BSO broadcast on the Sunday a week later. In the summer, live concerts were aired every Friday night, Saturday night, and Sunday afternoon, so the repeat time-slot wasn’t available. Now with the start of a new regular season, the rebroadcasts have been moved to Monday nights at 8pm–they’re not cancelled, merely shifted by a day. As for the online listening options, I don’t know why Elom thinks only “months-old recordings” are offered. With only a couple of special exceptions, every concert broadcast from Tanglewood, and every concert broadcast from the last winter BSO season, can be streamed on-demand from the WGBH website. They’re made available within days of the live broadcast, and remain accessible for a year. The BSO Concert Channel plays all the music from the past year’s concerts in a continuous loop, and it too is pretty much up-to-date now. It does appear that WGBH/WCRB is cutting back on its budget, presumably due to overall tightening at WGBH. The engineer who has done the BSO broadcasts for many years, Jim Donahue, is no longer working for the station, and a new engineer has taken over the BSO responsibilities–we’ll have to see how this affects the results over time. And WGBH is sending out fewer recording teams to capture live concerts in the region, so groups may have to take responsibility for making their own recordings and submitting them for possible broadcast. Overall, it seems like WGBH/WCRB has moved somewhat in the direction of the immediately preceding owners of WCRB (Nassau Broadcasting), but they haven’t gone quite as far toward the “classical top 40” format (yet). Ratings for WCRB under WGBH’s ownership were dramatically down from those in the late Nassau era–even though both periods suffered from the weak and poorly-located transmitter at 99.5, compared with the “old days” of independently-owned WCRB at 102.5–and it’s clear that WGBH felt that it was worth going back to a more “popular” format. I’m planning to do another careful comparison of the BSO broadcasts in all their formats, as a follow-up to the one I arranged a year ago (reported at https://www.classical-scene.com/2013/02/08/12-ways/). A number of things have clearly changed since then: the live stream now sounds pretty good, for example. Look forward to an article here after we have some results. At Thursday night’s performance people seemed unsure and uneasy about the five minute break. It seemed to me that not many people had read the program notes, which discussed the five minute pause in detail. I was bemused by the applause that occurred midway through the pause. Sitting in the second row center, I couldn’t see that it was in response to the soloists walking out on stage. I attended two of Levine’s performances of this symphony in 2010, and I don’t recall that he observed the long pause. It was good to see that the Tanglewood Festival Chorus was allowed to sit until they were needed. No repeat of the Mahler 3rd incident of last year :-). Maestro Dohnányi has been using a score in all his rehearsals and performances, but there’s no question of his mastery of this complex work. He is more attentive to the details that Mahler has so carefully notated than most conductors, and having the score at hand may be one reason why. I went to one of Seiji Ozawa’s performances in 1999 with Paula Delligatti and Florence Quivar, and he did observe a pause after the first movement, but during it he left the stage and came back with the two soloists. I don’t remember if there was applause at that point or not, but I do remember it being an excellent performance. Ozawa drew out those percussion crescendos in the last movement for a VERY long time! Another Mahler instruction was observed as well. The initial verses of the chorus were sung while the chorus was sitting. They stood up later at a point in the score specified by Mahler. The purpose of Mahler was to have the initial entry of the chorus so soft that would seem to arise out of nowhere. He felt that the visual disturbance of seeing the chorus stand before it’s first entry would detract from that intent. There has been a bit of press in the last year or so about implementing that five-minute pause, and in fact, as others have noted here, it also was spelled out in the excellent BSO program notes (by the late Michael Steinberg). And also “in fact,” there seemed to be very few attendees arriving at that time in the performance we attended, on Friday afternoon; most were firmly in their seats. What WERE notable were two impressive variances from other Friday-afternoon performances I have attended: there was complete silence from the audience during that five-minute pause, a nod of respect and communality, it seemed to me, for the composer’s intent; and during the entire performance, I heard no coughing, no restlessness, no talking. The audience seemed unusually attentive. Due to the largesse of a friend, we found ourselves in row H, which, for the amplification of the orchestra, was actually the fourth row from the stage — a bit close, yet rewarding in many ways. We could clearly see Dohnányi. He did indeed use a score, but clearly for occasional reference; what was most evident was his control over the orchestra, and he smiled at various members on delivering the goods — as he saw them. As for that entrance, I enjoy mezzos that have a deep, throaty, strong mellifluous voice, and Sarah Connolly did; she was perfect. Overall, we were very moved by the sterling performance, and comparing it to the Ozawa one, which we also heard, we found this one superior. As for that pause, at the time, we did not realize what it was, and now, in retrospect, perhaps it was an unnecessary distraction, destroying that moment of introspection? Another item on this performance: I wondered why the chorus was not asked to stand at its first entrance, so was pleased to read Mr. Rakatansky’s comment. Addendum. Ommigod. Total perfection. Jessye Norman, singing with Claudio Abbado’s ECYO. What’s the big deal about taking a break after those long Mahler first movements? Were I a conductor I’d love to program the Brahms Tragic Overture followed by the Mahler Tragic, with an intermission after the first movement. Then, after intermission, play scherzo/andante/finale, and that makes a great program. Take a 15 break after the first mvmt. of the Mahler Third, too. I’d love to see a program with the Schubert Unfinished followed by the 1st mvmt. of the Tenth Symphony, and then take an intermission after the first movement — two unfinished masterpieces, with an intermission carefully placed to show the listeners some respect. For most of the BSO crowd, the break does not make any sense. Anyway, It is much more important to point out the singers’ dresses last night are more interesting than the ones shown in the picture. small details matter, I think the conductor helped them out a lot. I noticed a little muck in the low strings at the beginning of the 1st mvt on Saturday, but it seemed like early vertical alignment problems as the orchestra settled in. It seemed to me that the basses were together and the cellos together, but the sections were not with each other until a few bars later. I’m hesitant to cast blame on either section individually. how things would shape out in the new WCRB programming. on Saturday nights and “World of Opera” on Sunday nights. good recordings but it’s hardly a “must hear” program. “Live from Fraser” older content than that. – but it wasn’t aired on any radio broadcast of which I’m aware. week were devoted to live and original content. rolling tape [I have such experience from working with rock bands]. WCRB that would air them? All cancelled. commercial CDs like the rest of the WCRB playlists. what we have lost here? Concert” – is now cancelled. What a deal that was! nobody seems to care anymore. I hope I’m wrong. Great, looking forward to it – thanks! “Pause” is used in German to mean “Intermission”. Did Mahler intend for an intermission after the first movement? Thanks to Elom for laying out some important issues. As suggested, I compared the weekly schedules, and I see we’ve lost Sunday Concert, Carnegie Live, Live from Fraser (already reduced to two hours per week in 2012), New England Summer Festivals, BSO on Record, the repeat of The Bach Hour, and 3/4 of the air time of Performance Today. I believe that the most important service WCRB performs is broadcasting every BSO Saturday concert and all three of the major concerts each weekend of the BSO’s Tanglewood season. As long as they’re the only local source for that they’ll still have my support. And I’m sympathetic to the need to attract new audiences for classical music, and not drive them away with too much “difficult” music. But is it only the loss of signal power that made WGBH’s classical programming nonviable on WCRB? Ben Roe has a lot of ‘splainin to do. It seems to me that WGBH should look at itself as a unity, not a bunch of separate fiefdoms, and send a little of the money used to produce programming for TV and 89.7 to 99.5 to restore locally produced programs for Classical New England. If ‘CRB can only use the money they directly raise, there’s no benefit to their being under the thumb of the ‘GBH Foundation (other than having a performance studio they don’t get to use). Gah, with friends like Elom, CRB sure doesn’t need enemas. So far as I can see from the CRB website, when you click Donate, you’re presented with a dropdown where you can specify what it goes to. Unless of course you think they’re simply lying, which sometimes seems to be the spirit here, in the same evil vein as all else they do, including programing, the assumption being that nobody cares including the station. Criminy. How substantially do the carpers here give, I have to wonder. Please ignore my previous comment. It treats David Moran’s last line of October 7, 1:23 a.m., as if it were worthy of a response. David, that’s all well and good, but when one is at the Leadership Circle level via automatic monthly donations, one doesn’t get asked where the gift should go. I believe that they continue to go where one directed them when one signed on as a “sustainer.” I certainly hope everybody who cares about WCRB donates generously, since withholding donations doesn’t “teach them a lesson;” it just leads to further cutbacks. I agree with you that there is no reason to suspect that donations are allocated contrary to the donor’s directions. I also think that there are still real questions about whether more of the undesignated donations shouldn’t go to WCRB. Doesn’t the WGBH foundation have enough unrestricted income to be more of a cash cow to WCRB? Would TV even miss what it would take to restore the various forms of live and “recorded live” programming that have been cut? In short, I think there are serious questions to be asked. I look forward to hearing from Ben Roe how much of the change in programming over the past couple of years was audience driven (arguably part of the mission to serve the public — and not just the cognoscenti) and how much is the result of discretionary decisions on the part of top management not to allocate more money to ‘CRB (arguably poor management, maybe even failure to serve the public). This thread has left topic; if it needs to be continued, it should be on its own merits. Apparently, ‘GBH carping is allowed on any BMINT thread and is always appropriate. It’s a guaranteed way to bring in the seagulls to pick at the carcas of what once was three score years ago for those who have not discovered Pandora, Spotify, Internet radio, or I-tunes. Agreed- this thread is off-topic now. Please hold further comments for a WGBH themed article later in the week. Sorry I could not accommodate earlier with some analysis of a subject dear to our readers.